bell pepper | Leo Tunapika? 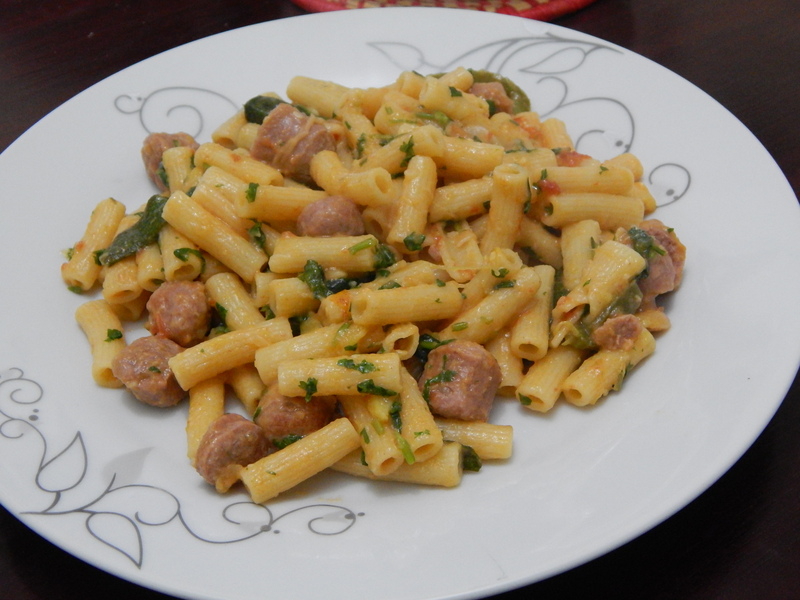 Quick lunch /dinner recipe that will leave your taste buds asking for more. 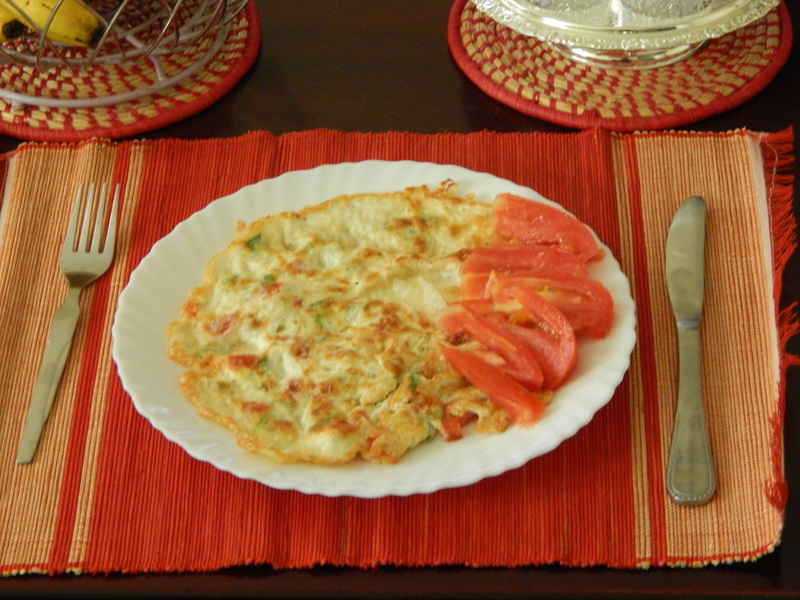 This is a dish I have prepared on several occasions. 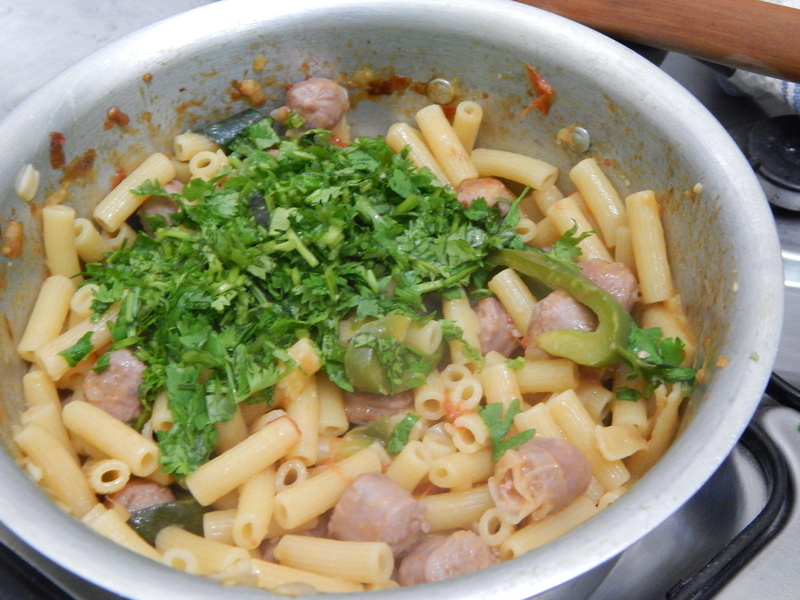 It’s debut on the blog was as pasta motukanio which is a vegetarian version. 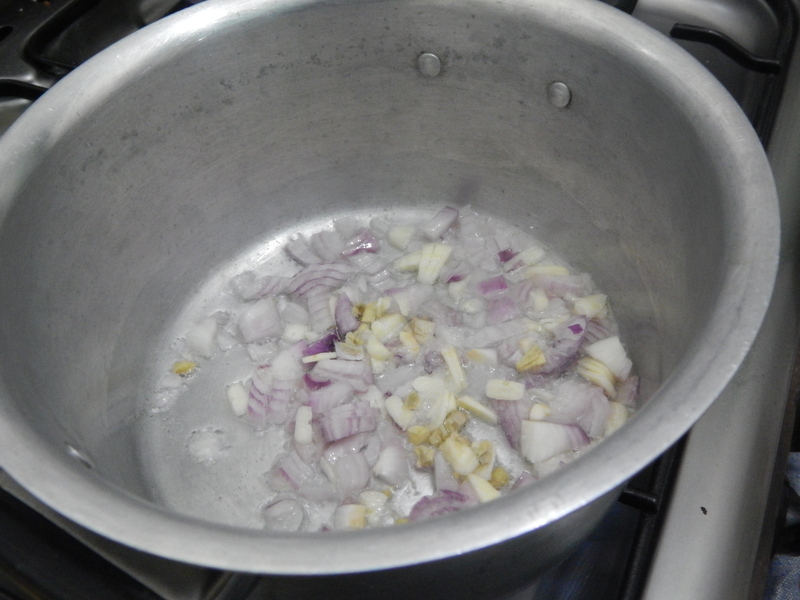 In a sufuria, heat the oil then fry up the onions and garlic. Season with salt and pepper. 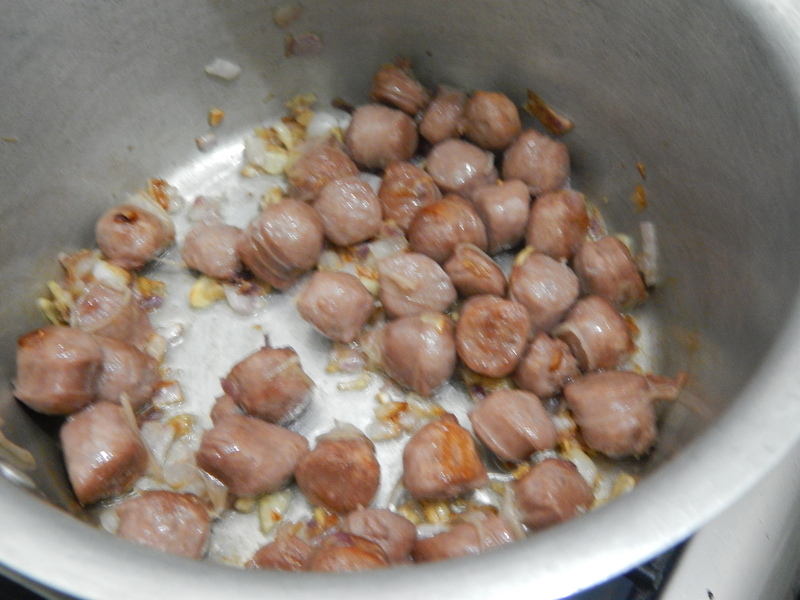 Once lightly browned, add the sausages. Cover and let it cook down. 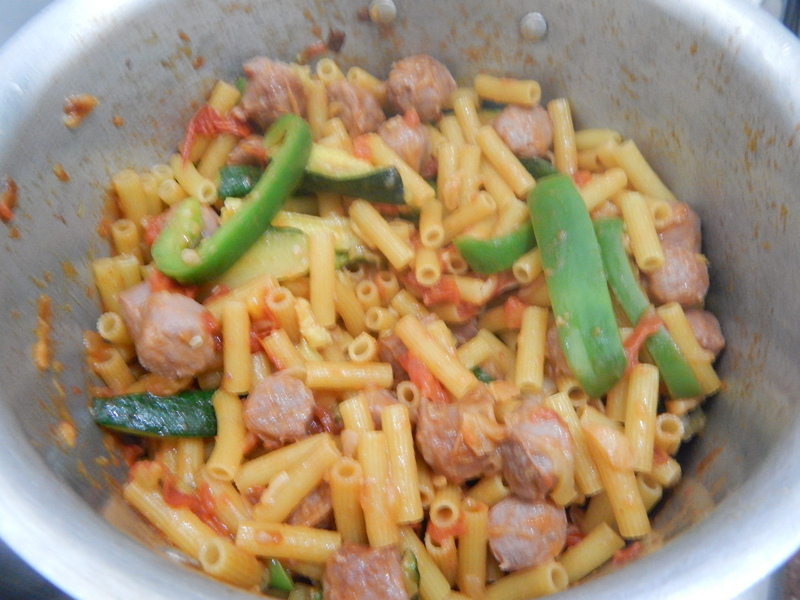 Now add the pasta and stir it in. 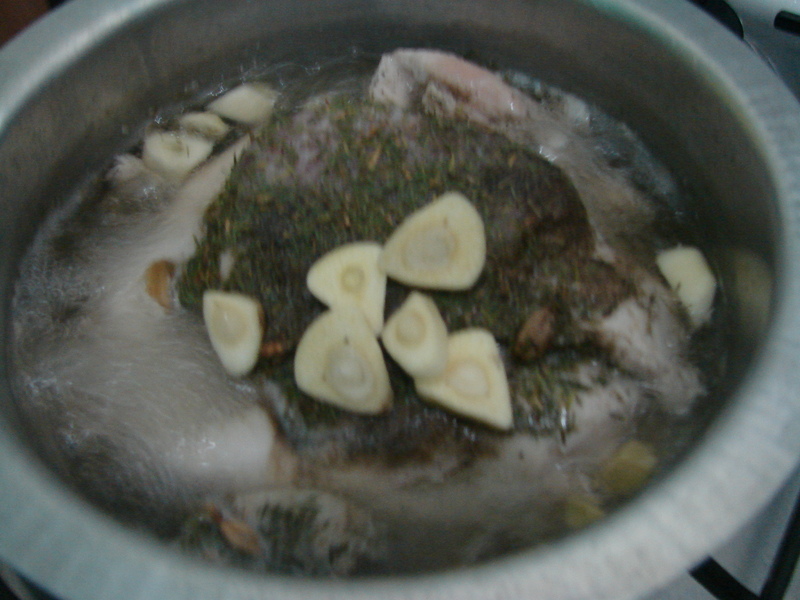 Now add the water/broth. Add just enough to reach the level of the pasta. 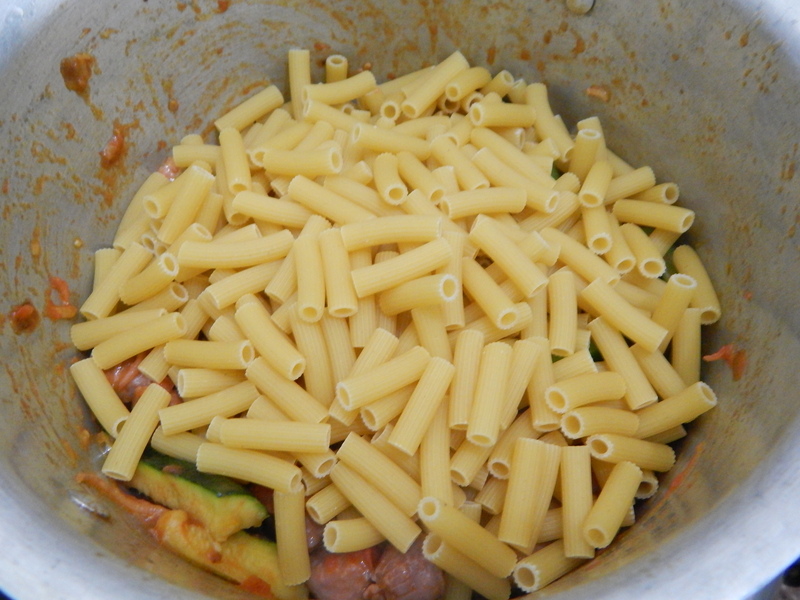 Cook the pasta according to the time specified on the pack or till al dente. Taste for seasoning and adjust accordingly. Turn off the heat and add the dhania and stir. This is a quick and easy recipe that you can whip up even on a workday. Heat your skillet/pan , heat the oil about a two tablespoons would do. 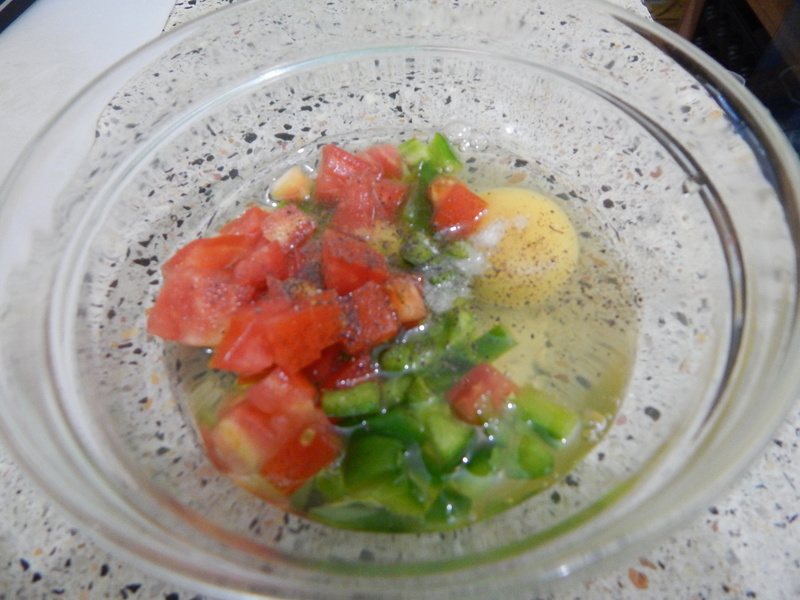 In a bowl, mix in the eggs, tomatoes, bell pepper, salt and pepper. 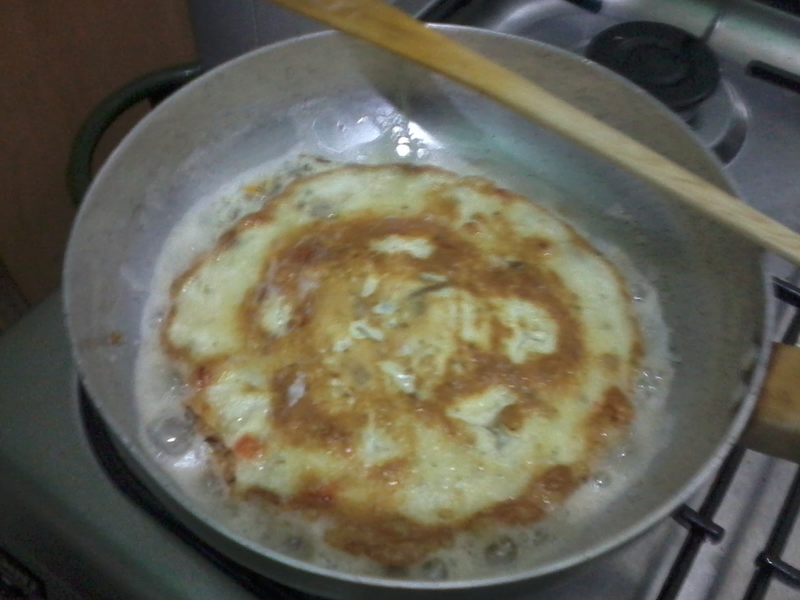 Cook the egg according to your preference. I like mine well done. 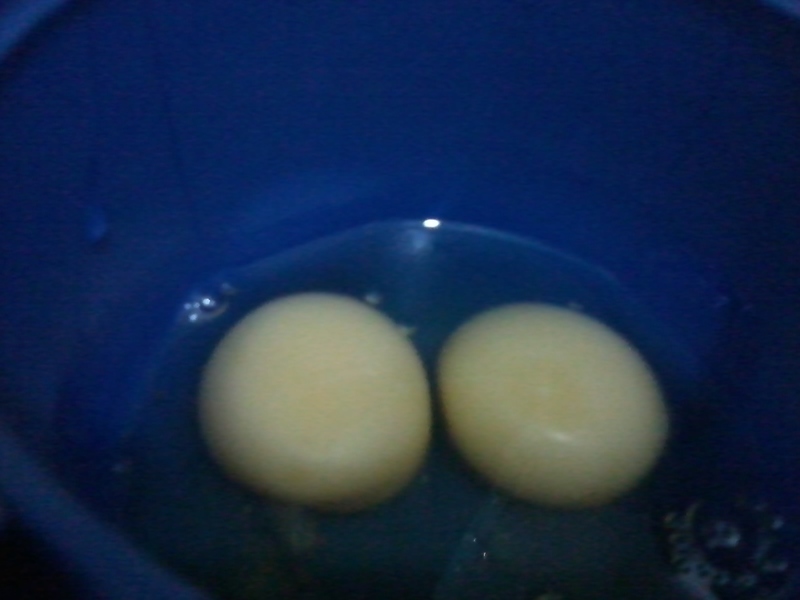 Then the hard part, egg turning. Let’s just say even with hubby not being around I did it successfully! I’m always in search of a challenge when it comes to cooking. 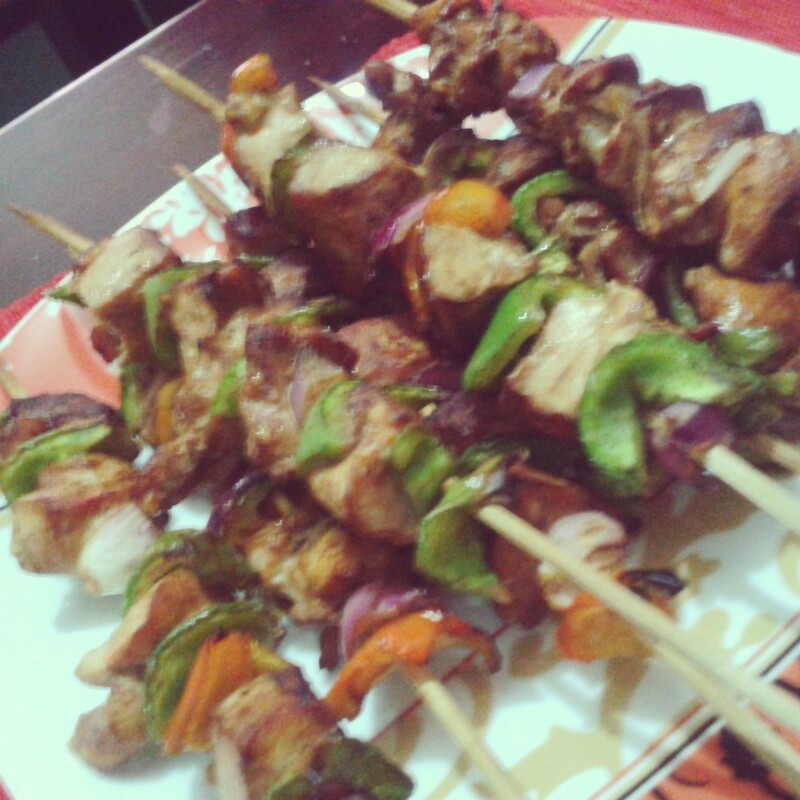 A while back I bought wooden skewers just for the sake of having them in my kitchen. I normally use them for checking the readiness of my baked goodies but this time round I decided to put them into good use. 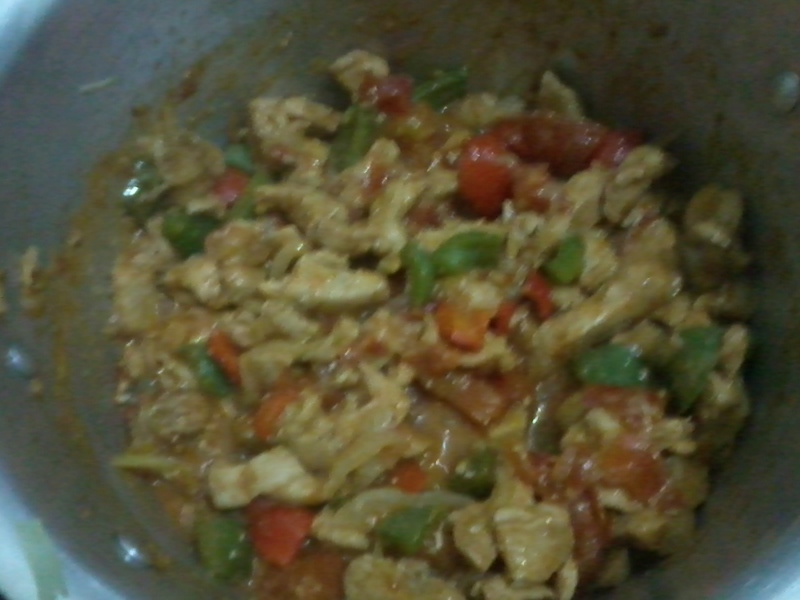 I have never made mshikaki before so I was just following my instincts on the flavourings. The key thing for this recipe to be a huge success is marination. Sadly, I thought of the recipe a tad late and hence I didn’t marinate and there was no way I was going to put it off for the next night, impatient much? Anyway, enough with the chatting let the action begin. Skewers, metallic or wooden will do. I used wooden ones. It’s advisable to marinate the chicken overnight but if you are in a rush like I was, you can marinate for at least 30 minutes before cooking. 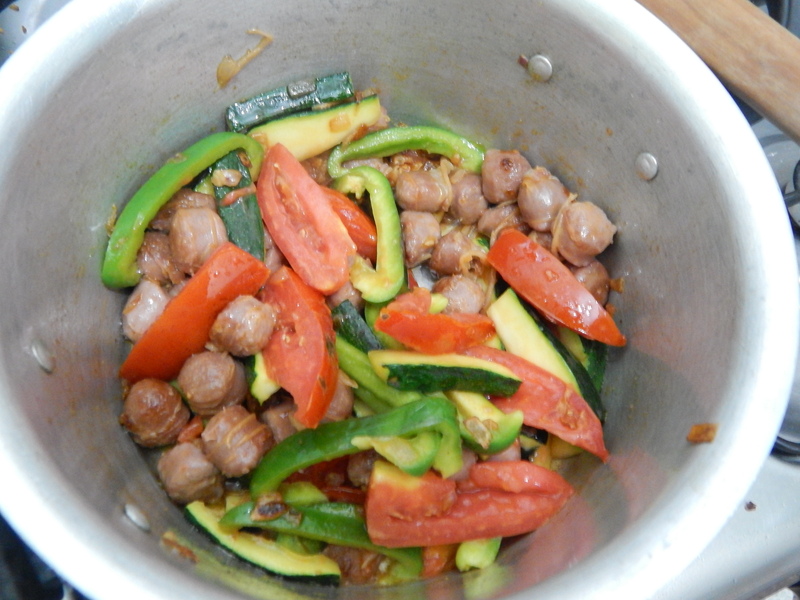 In a bowl mix the marinade, soy sauce, ginger and garlic. 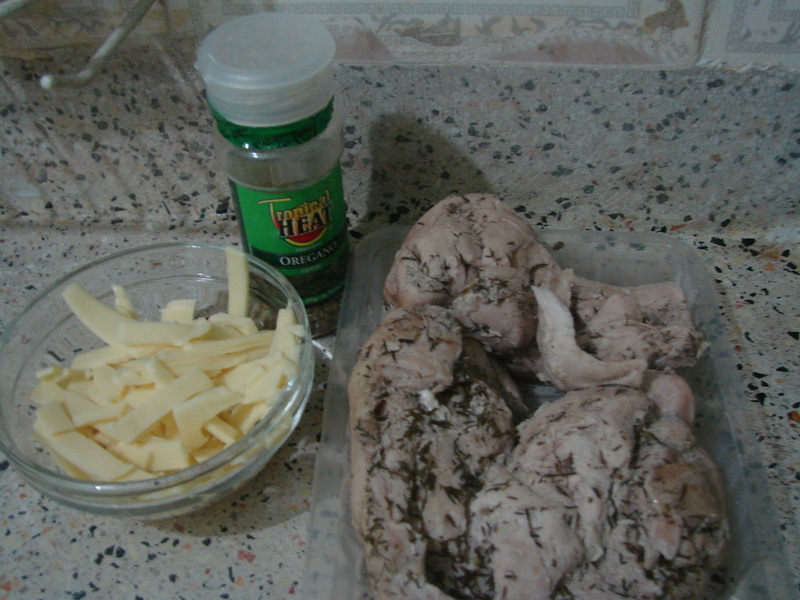 Add in the chicken pieces and coat them completely. If you are using wooden skewers make sure to soak them in water 30 minutes prior to using to ensure they don’t burn when grilling the mshikaki. 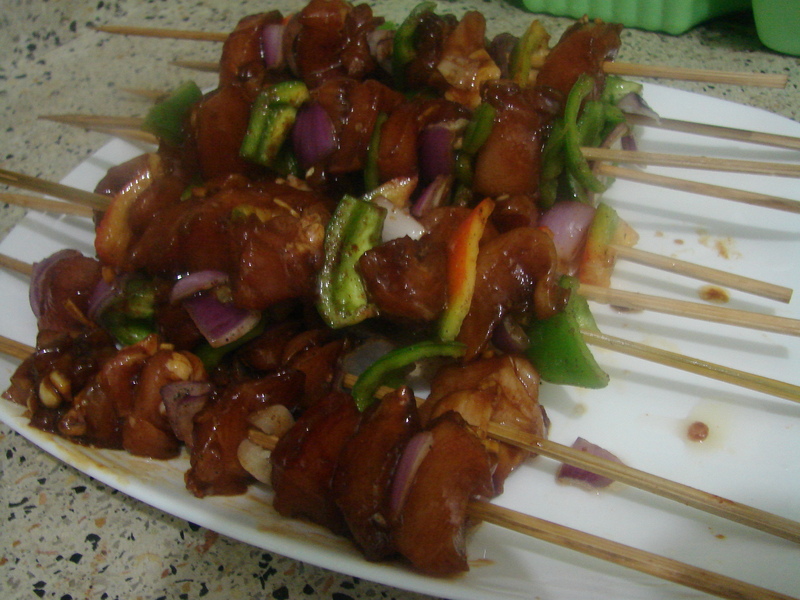 After the marination and the skewers are ready, you can now assemble the mshikaki, yippee!! 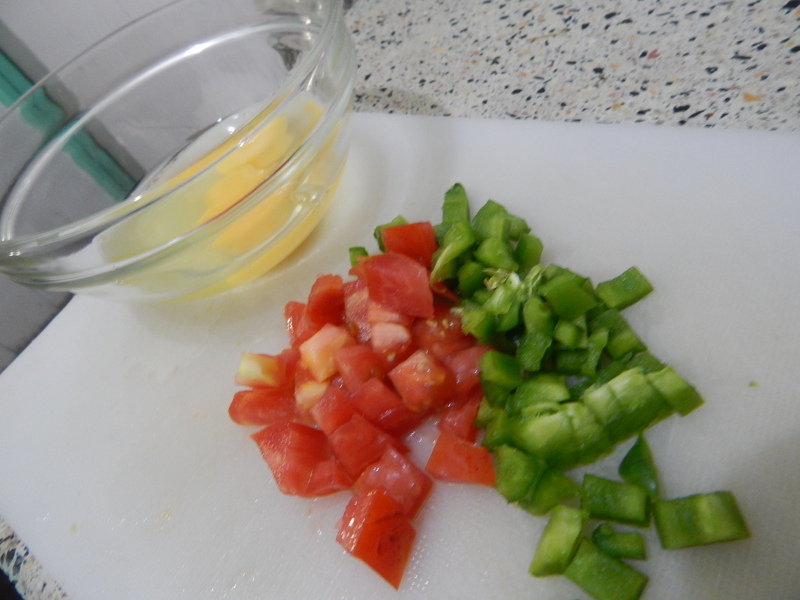 In a shallow plate add your bell peppers and onions season with a little bit of salt and the pepper then drizzle over the vegetable oil. 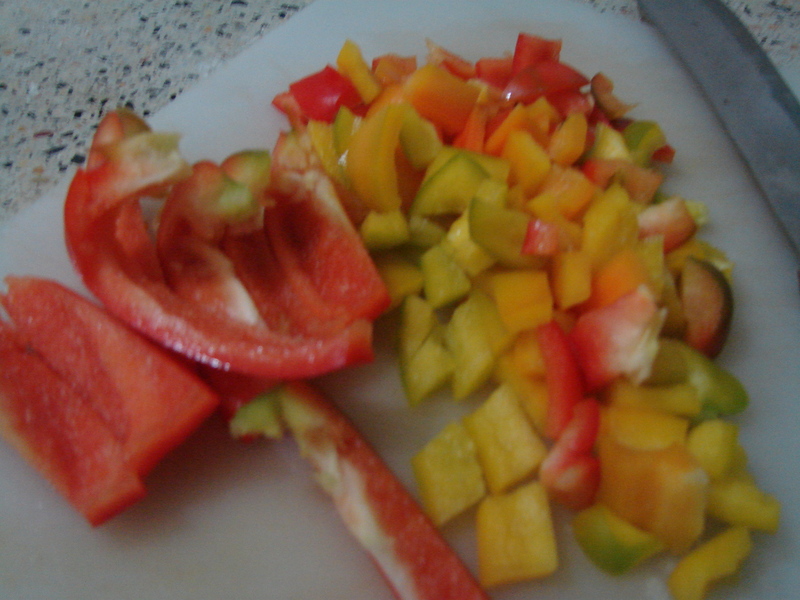 For the bell peppers, the more colourful they are the better, so go for red, yellow and orange. The next step is pretty hands on and I only managed to take pics of the end result seeing that hubby was also helping me to assemble them. 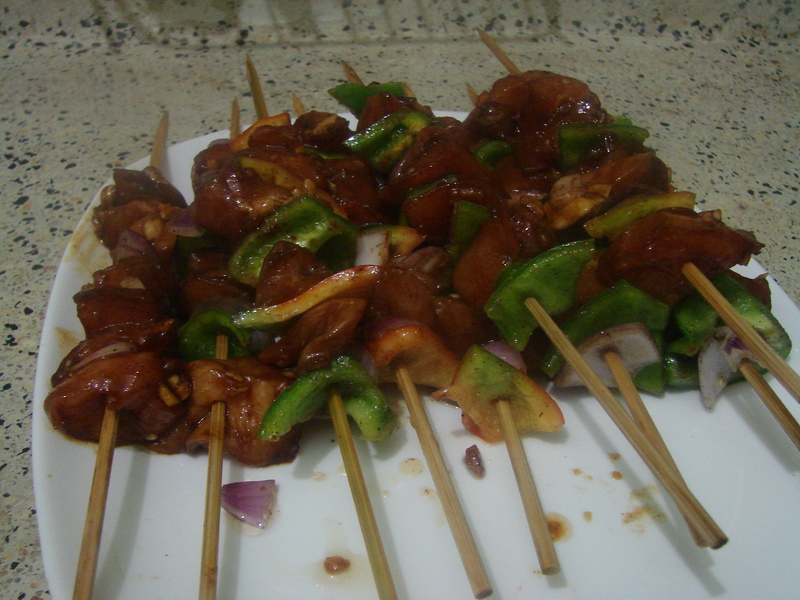 On a skewer start with the bell pepper followed by the onion then the chicken piece then repeat the step until the desired amount. 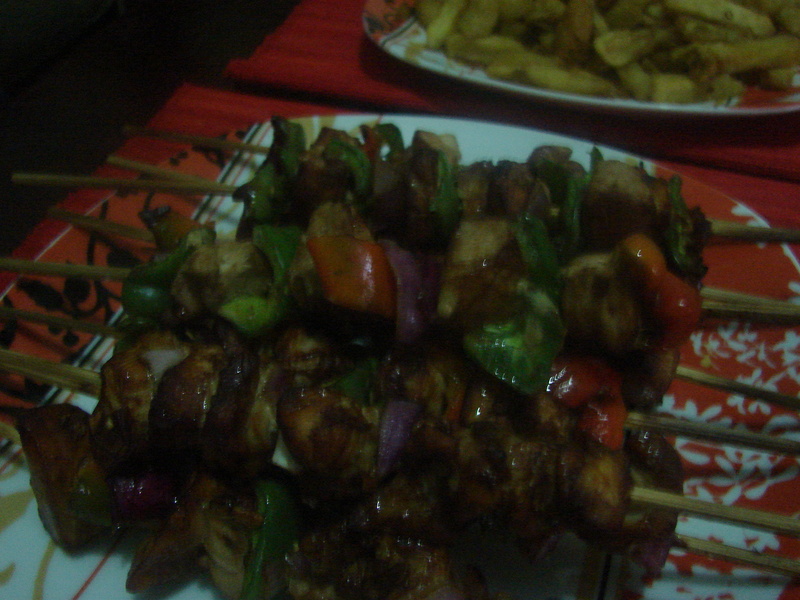 It’s best to leave space on the skewer for someone to hold it when eating. Continue these steps until all the chicken is used up. You can either grill these on an outside grill or use a grill pan, seeing that I have neither I grilled mine in the oven. Place them on a grill rack and grill on each side for 10 minutes or until the chicken is done. Serve and enjoy with friends. Excuse the lighting, I forgot to take the pics while in the kitchen, my living room has the worst lighting for photos. 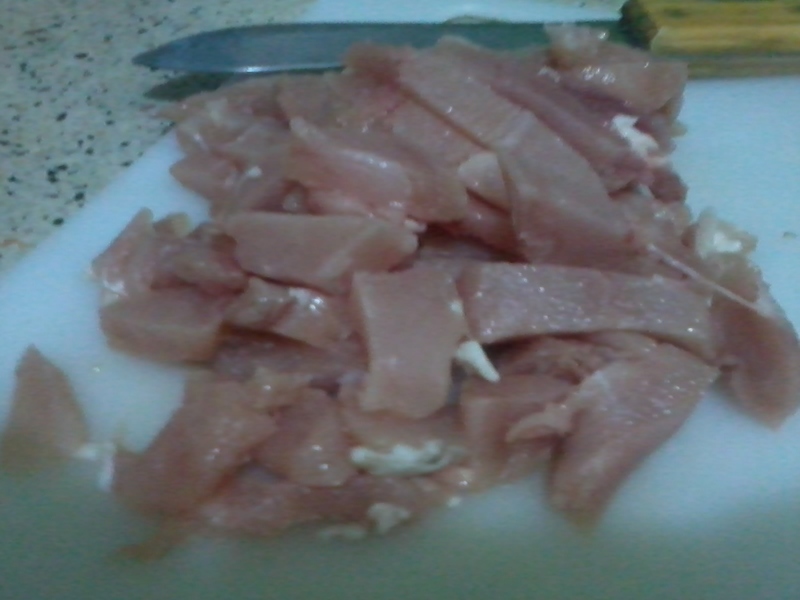 Start by poaching the chicken. 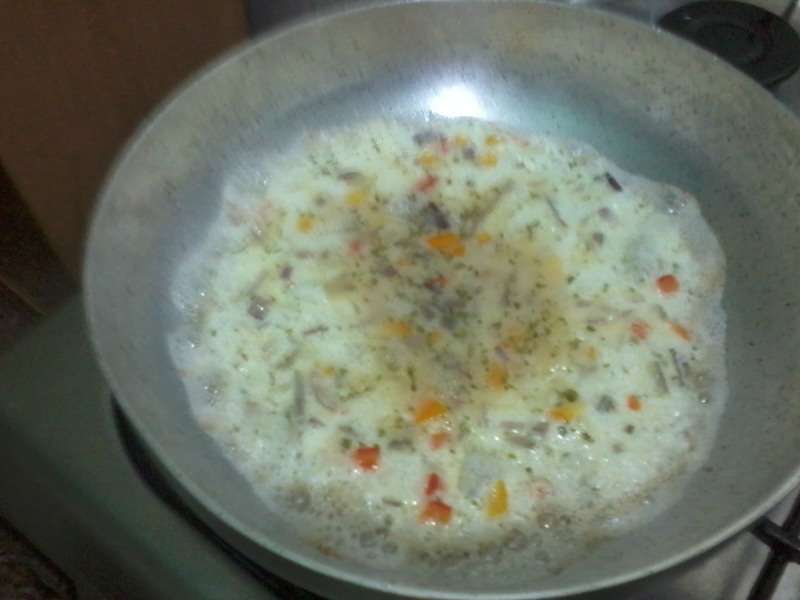 In a pan heat the vegetable oil. 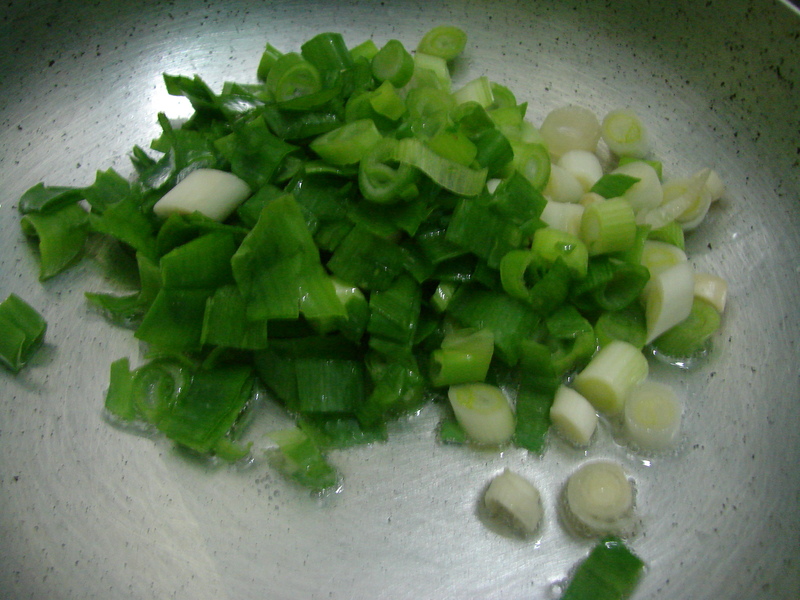 Fry the spring onions. 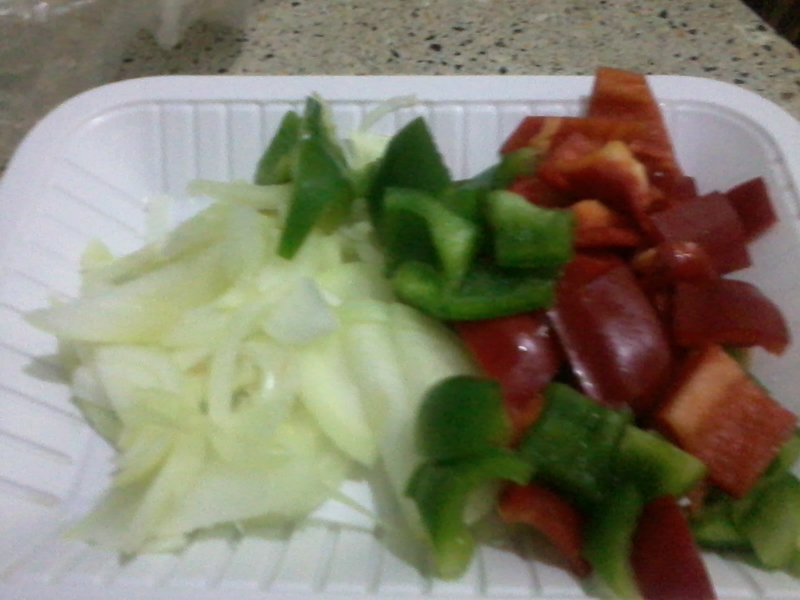 Let the onions cook for about three minutes then add the bell peppers. The chicken should be done in under twenty minutes. Drain and save the stock for later. Shred the chicken and assemble the quesadillas. This time I tried a different method, instead of folding the tortilla in half, I used a whole tortilla then covered it with another tortilla. It’s safe to say, I prefer the folding of the tortilla since I’m yet to make tortillas of the same diameter. 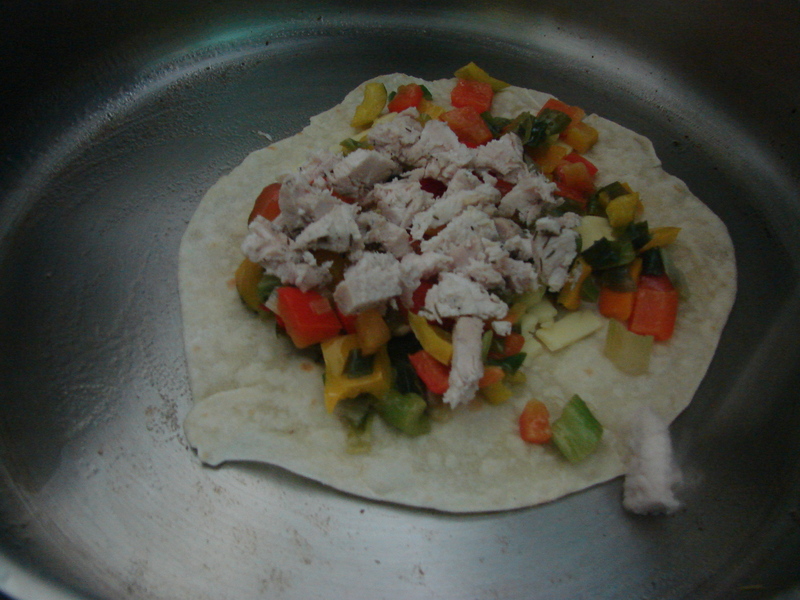 On a heated skillet, add a teaspoon of vegetable oil then place the tortilla and layer the cheese, spring onion and bell pepper mixture, the chicken shreds, sprinkle over the dried oregano and finalise with some more cheese shreds. Repeat the above procedure for all the tortillas. 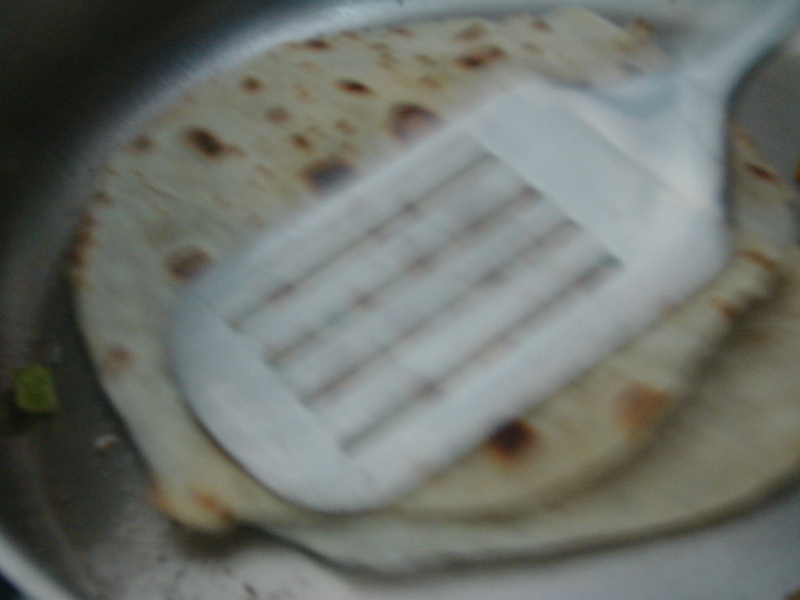 Using a pizza cutter or knife, slice the quesadillas. I apologise, I don’t have a decent end result photo. 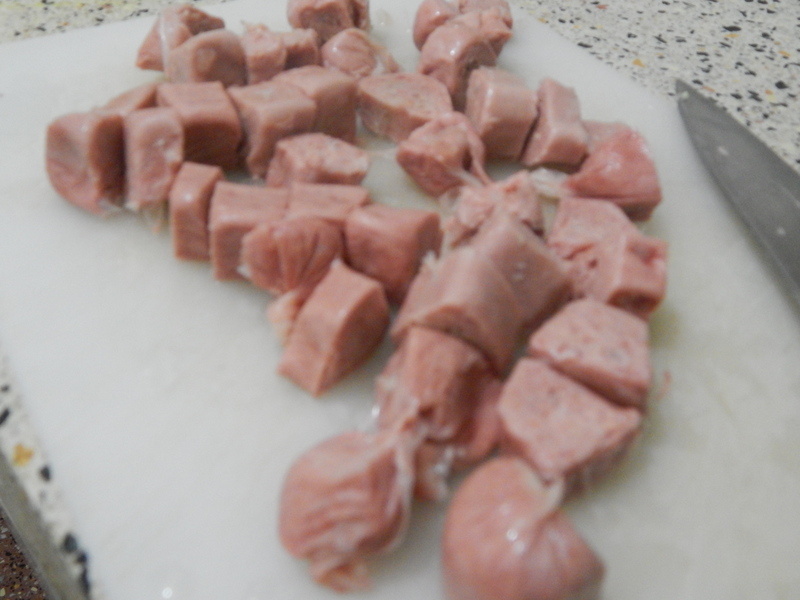 Sometime last week my colleague mentioned meatballs then I realised it had been quite a while since I’d prepared any. One thing with food is that when you start thinking about something you just have to get it. I figured all that I needed was the minced meat which I was sure I’d get from our local butcher. The beauty of this recipe over the previous one is that it’s less tedious since you just pop the meatballs into the oven and wait. Plus no frying involved hence it’s the healthier option. 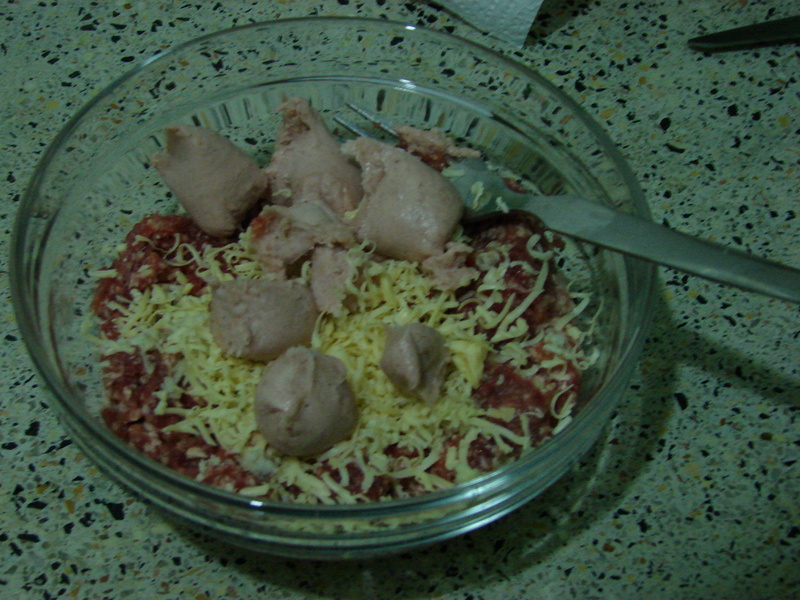 In a bowl, put the minced meat, sausage meat and grate over the cheese and garlic. 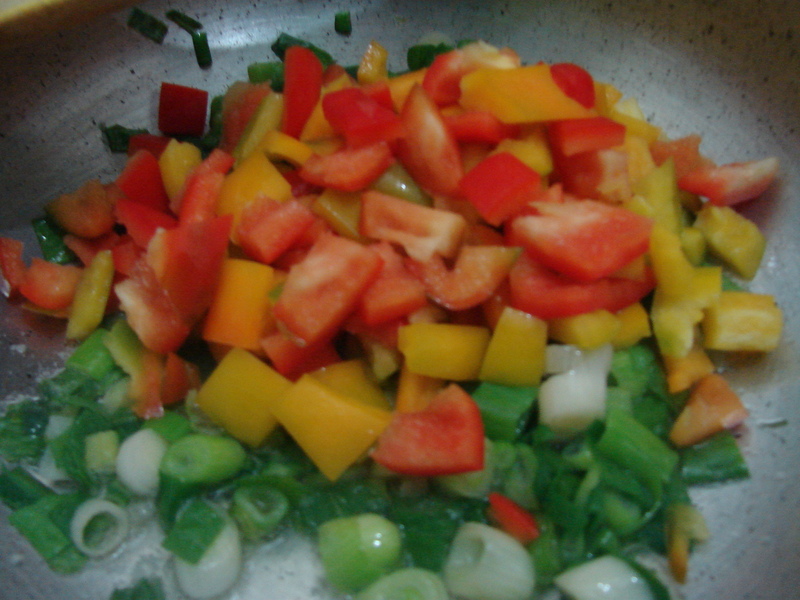 Mix with the fork till all the ingredients are well incorporated. 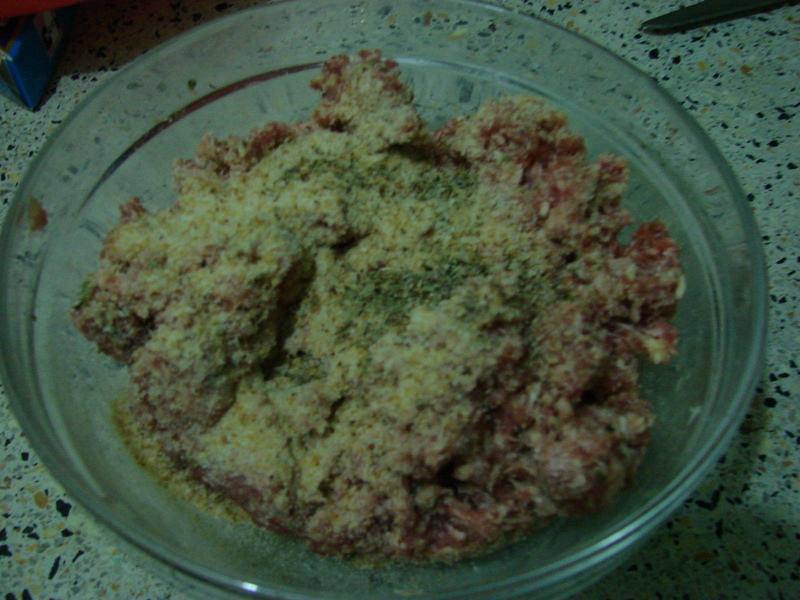 Then add the breadcrumbs, parsley, salt and pepper. Mix well and you are ready to bake. Well not just yet, make medium sized balls first. Remember to pre heat the oven at 350ºF. 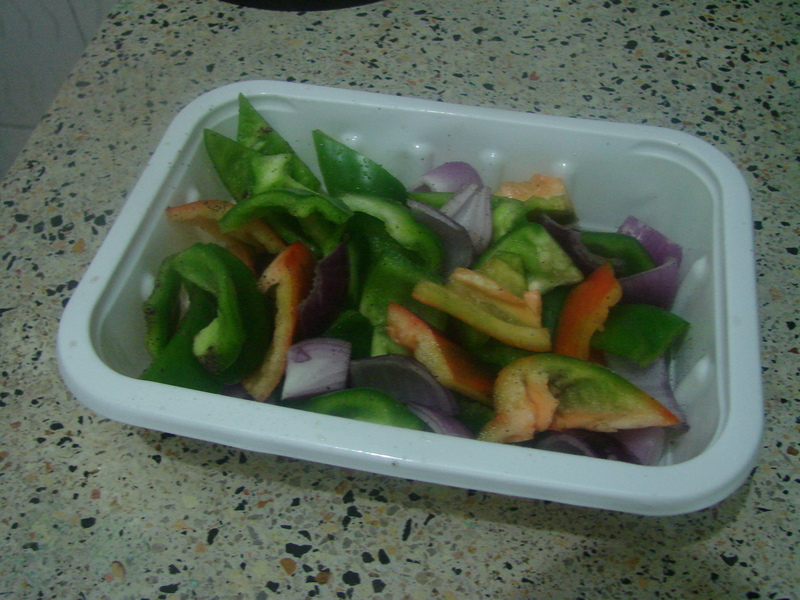 Oil your baking dish with some vegetable oil. 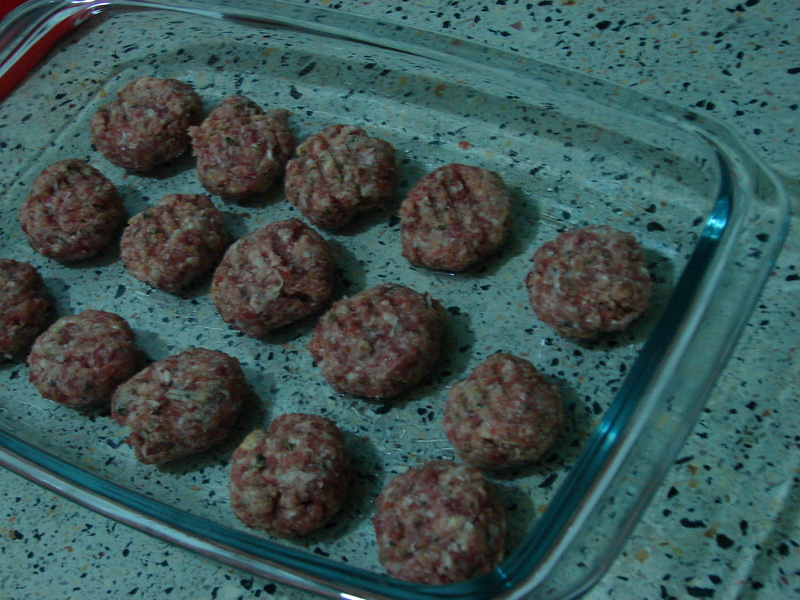 Place the meatballs onto the prepared baking dish then slightly press down with a fork. Bake in the oven for about 15 minutes. 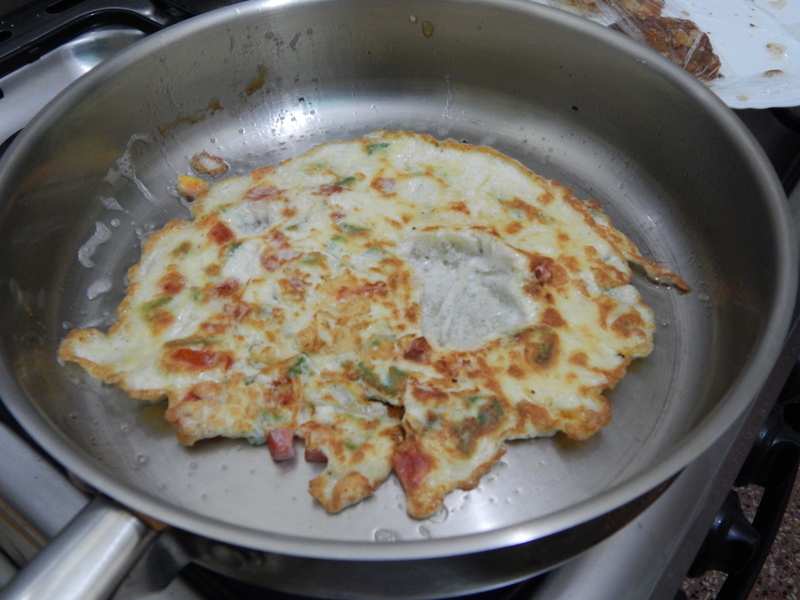 Remove flip over and let the other side cook for 5 minutes. Remove and set aside. 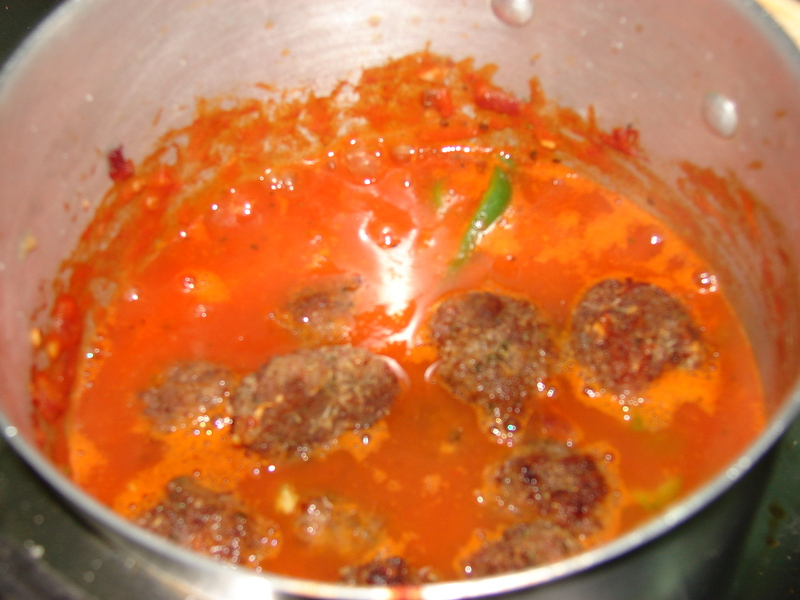 You can freely enjoy your meatballs at this stage but I normally prefer them in a sauce. 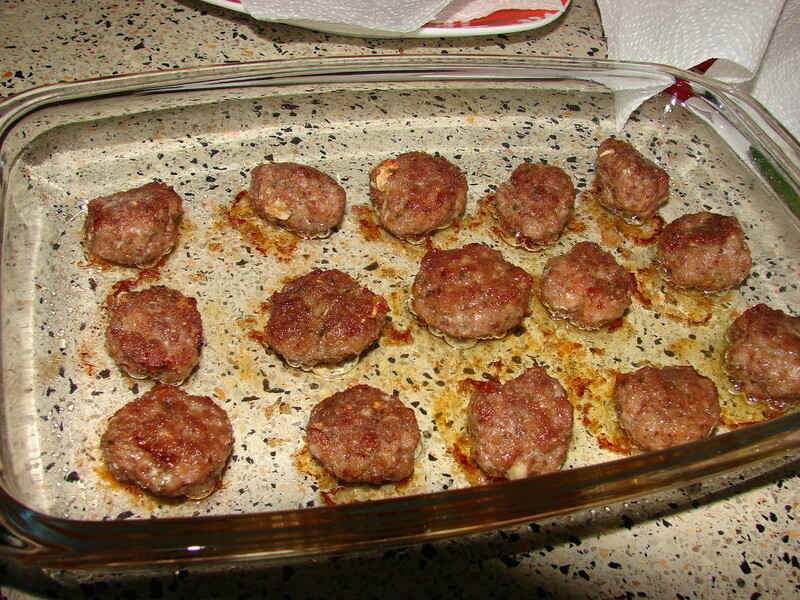 Put the meatballs on a paper towel lined plate so as to drain the oil. At this point, hubby had just walked in from work, without much thought, I quickly give him a bite of the meatball and his reaction says it all. Jackpot!! 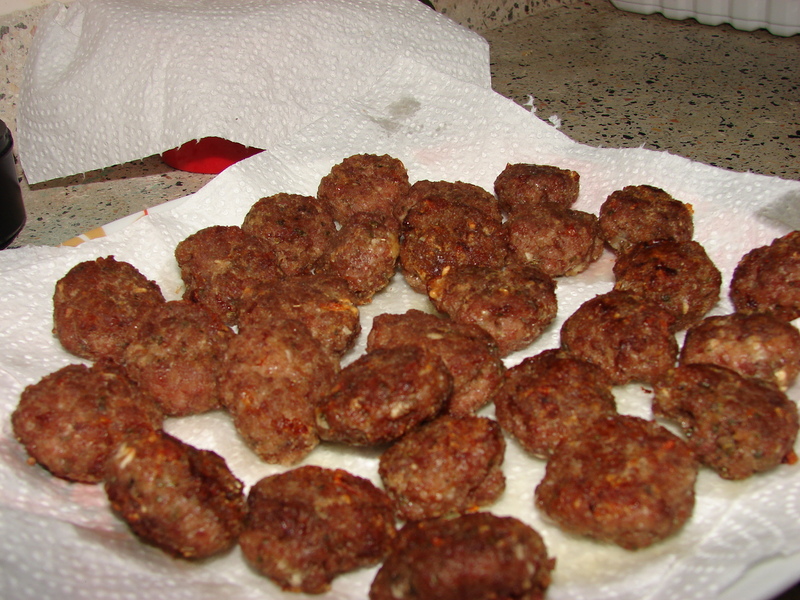 This recipe yielded 30 meatballs. I decided to store half for later and cooked the remaining half. 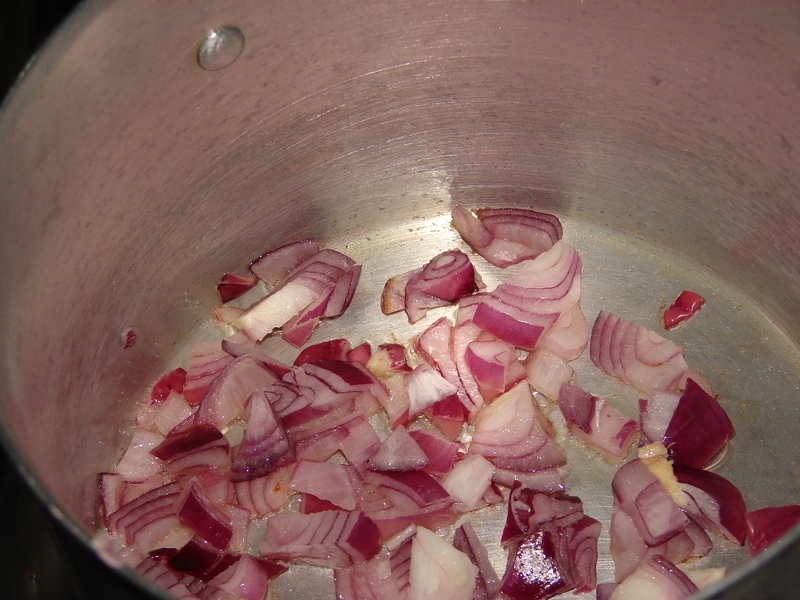 Fry the onions in 1 tablespoon of vegetable oil. 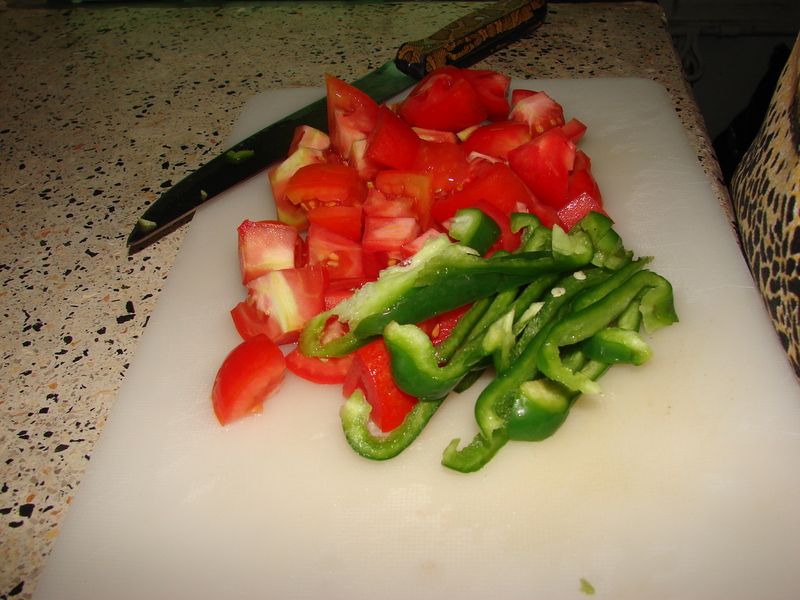 Cubed 2 tomatoes and slice 1 half of green bell pepper. 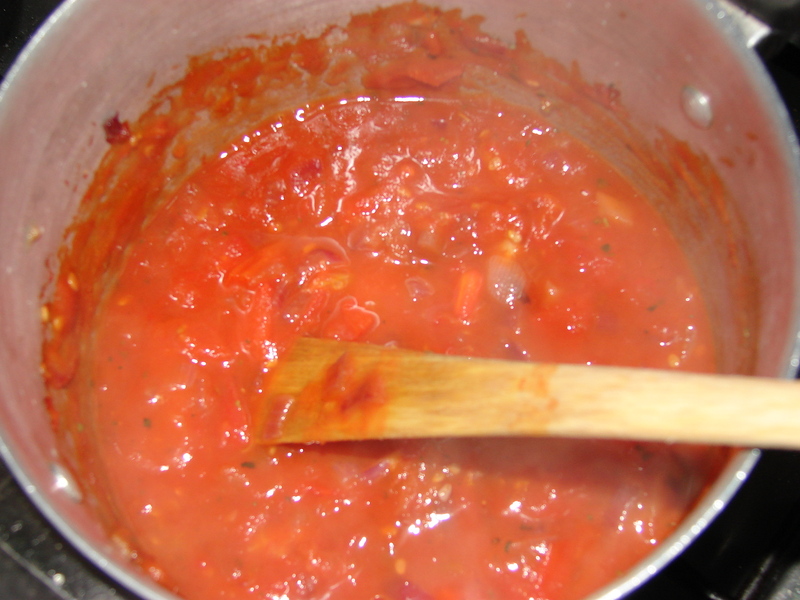 Once the onions are cooked, add the tomatoes and 1 tablespoon of tomato paste. Season lightly with salt and pepper. Cover and let the tomatoes cook down. Add just about 2 tablespoons of water. 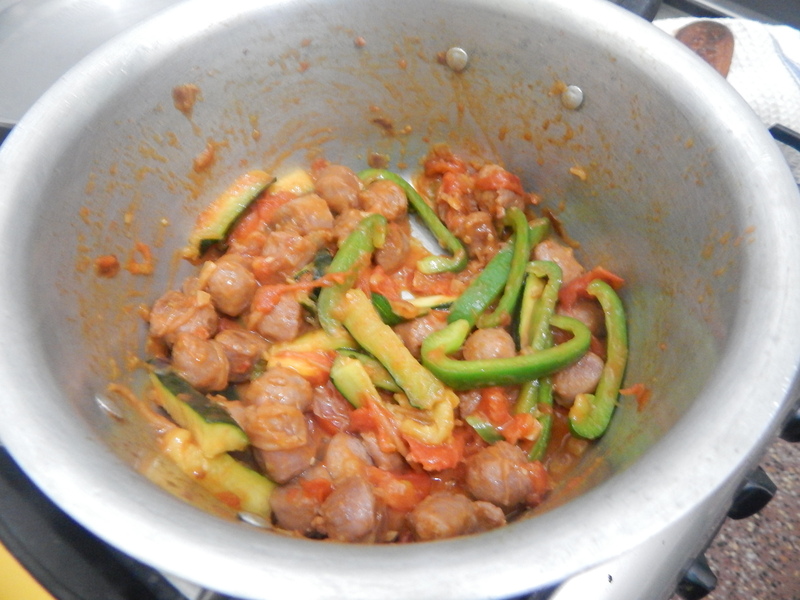 Finally add the bell pepper and meatballs. I served over steamed white rice. You can also serve with spaghetti. Best meatballs ever!! I kid you not. I dare you to try this recipe. You will not be disappointed. Yippee!!! This is my 60th post!! Wa!! Imagine. Thank you all for reading my cooking journal, commenting, liking and even trying out these recipes. I’m humbled. This meal I prepared a while back when we had a friend over for dinner. 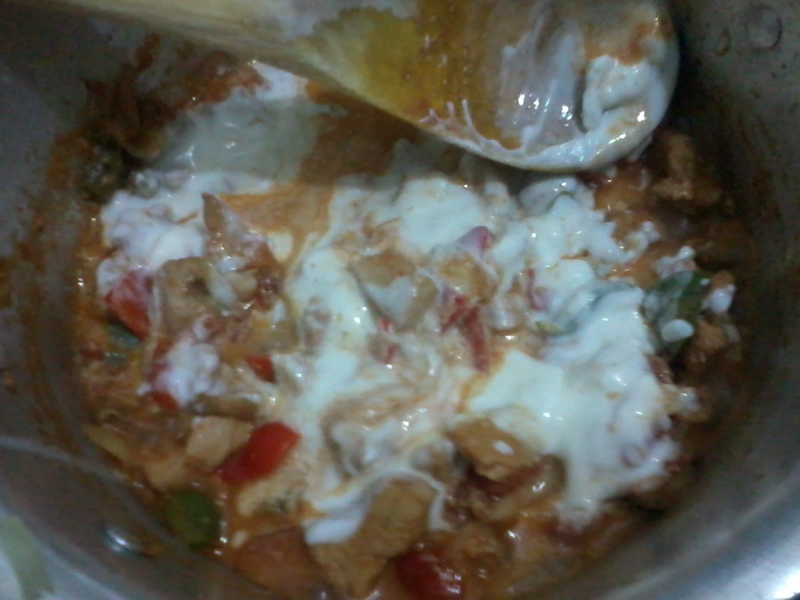 This dish closely resembles this one , however I used boneless chicken breasts and I also added some yoghurt. 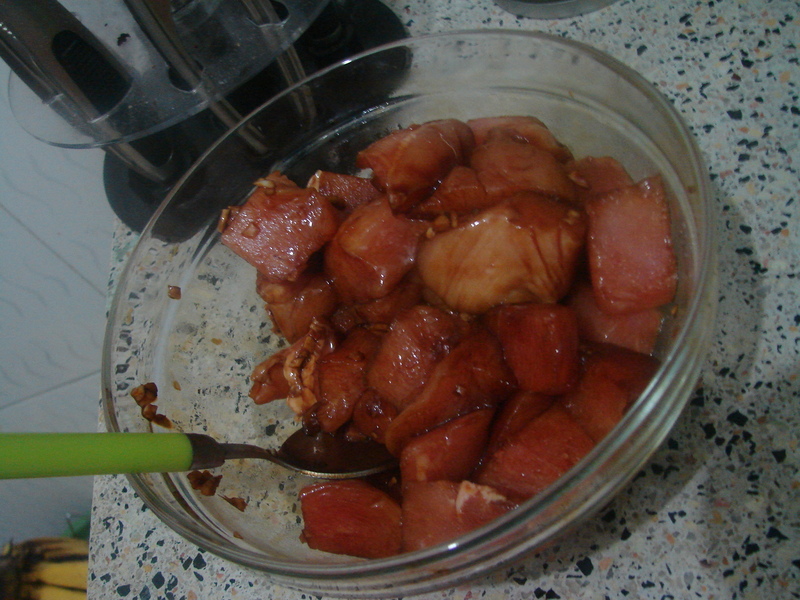 Start by coating the chicken with the soy sauce. 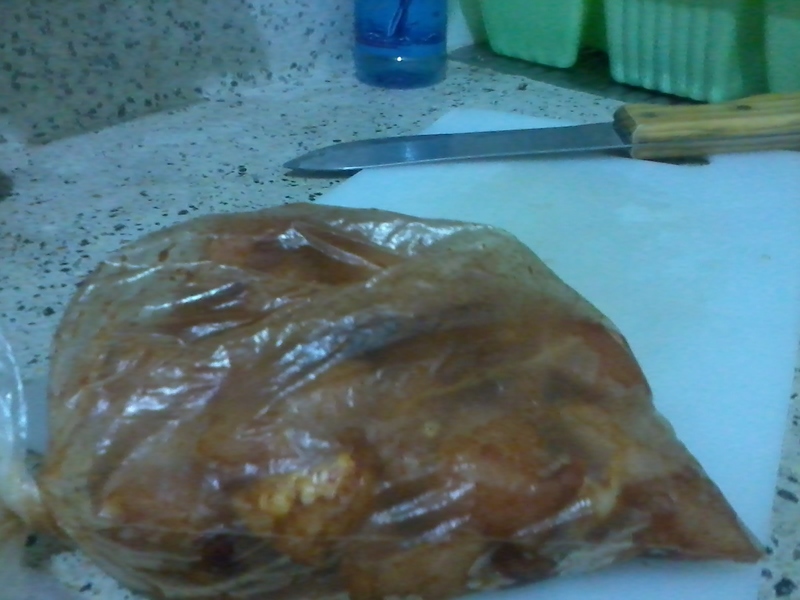 In a ziploc bag or polythene bag put the chicken strips then add the soy sauce then shake to ensure they are fully coated. Let it the chicken stand for 10 minutes or so. 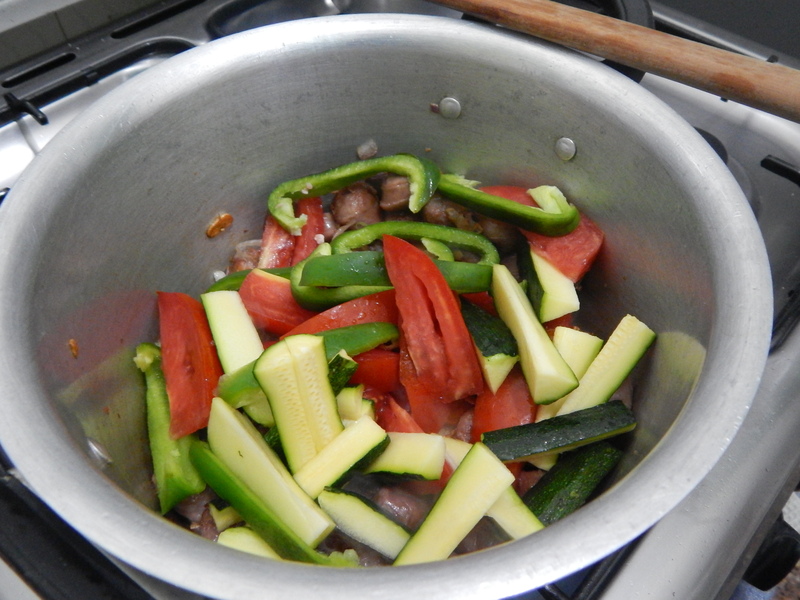 In a sauce pan, heat the vegetable oil. 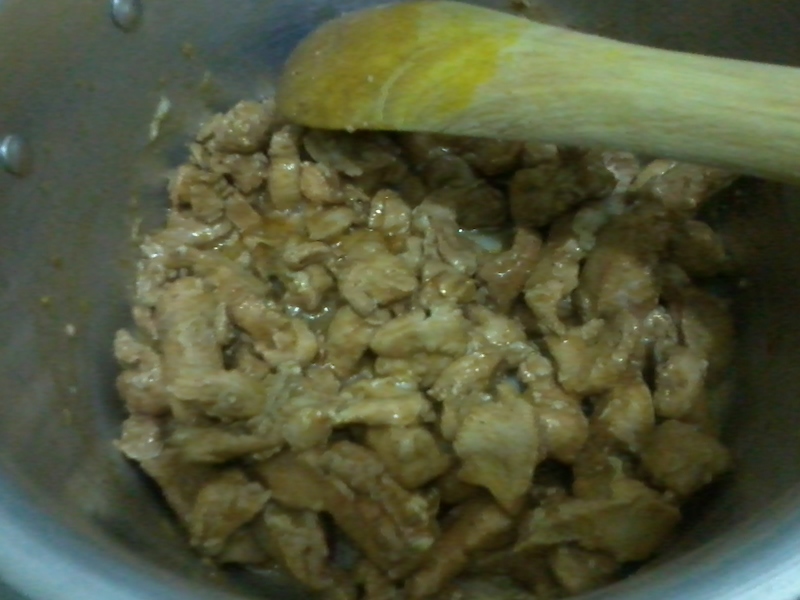 Add the chicken strips, stir to ensure the chicken browns. 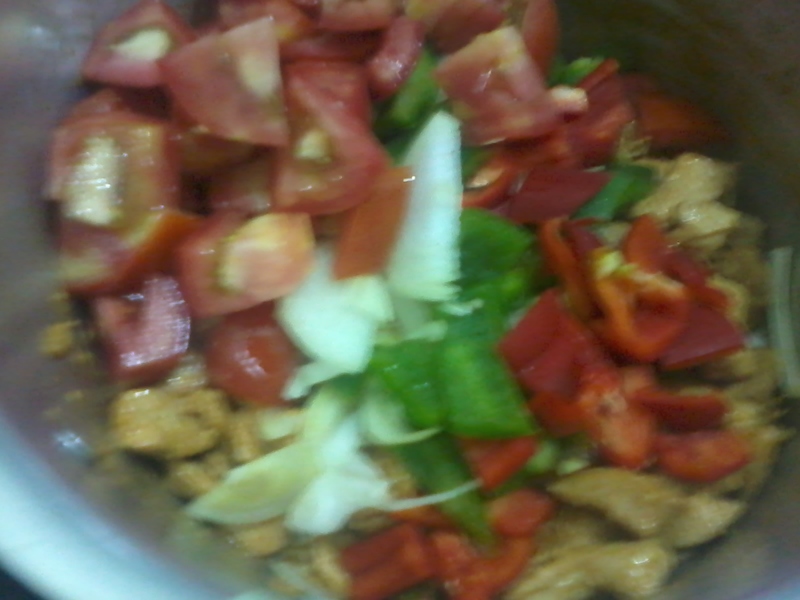 Let the chicken cook for about 15 minutes then add the onions and bell peppers. 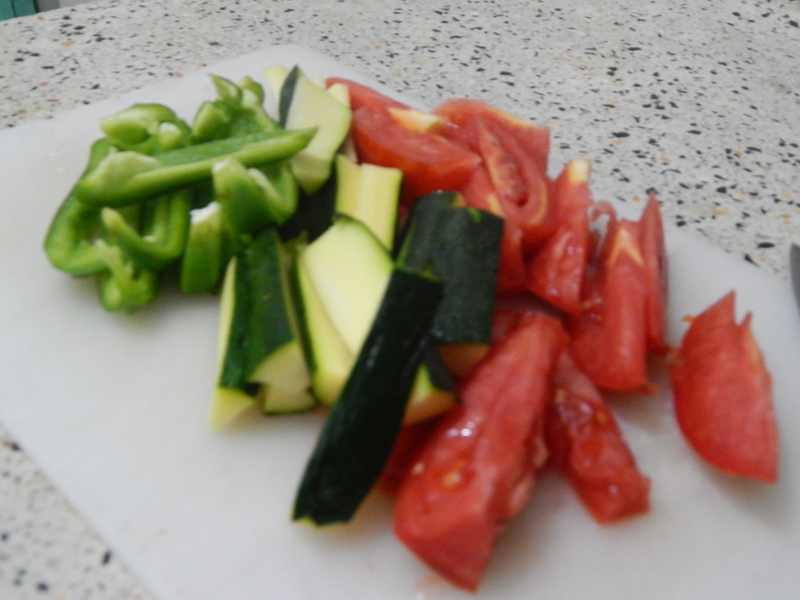 (I also added one tomato diced, after hubby’s advice). Remember to season with the salt and black pepper. 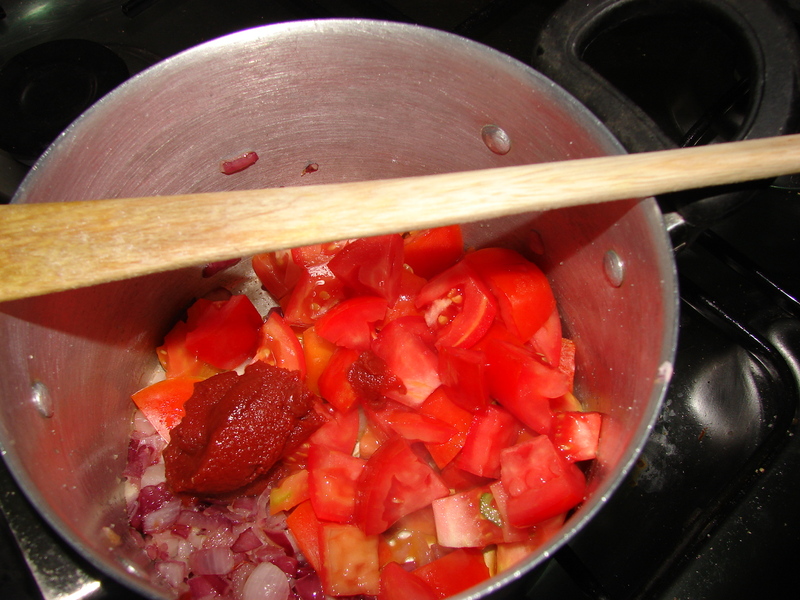 Cover and let the tomato, onion and peppers cook down. 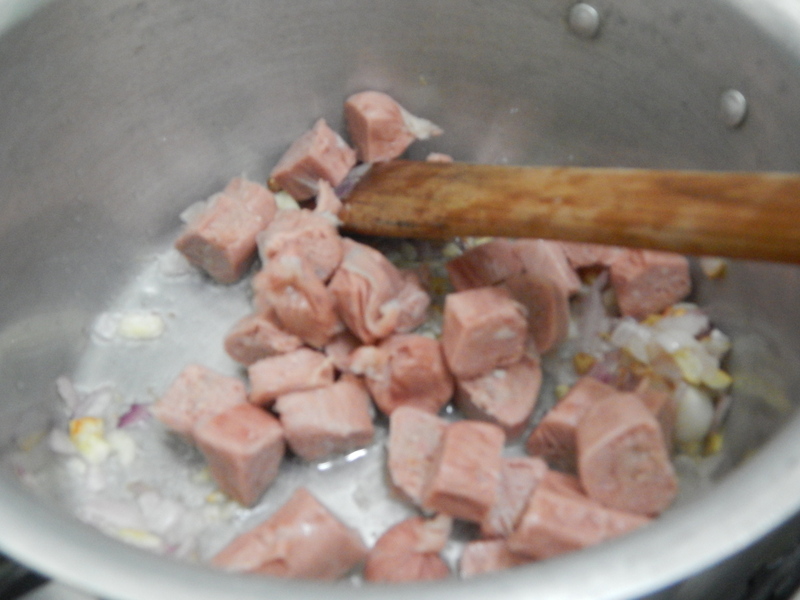 Cover for about 5 minutes then stir and serve. 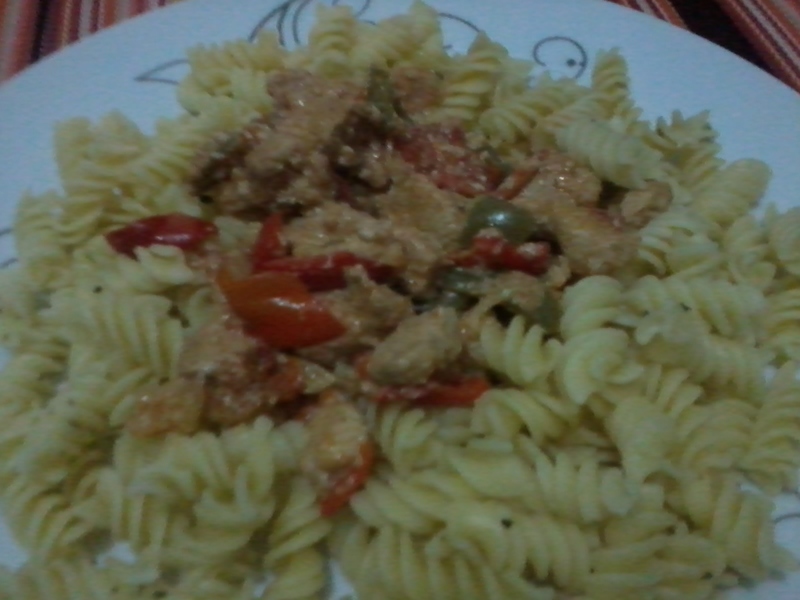 I served the chicken over steamed pasta but I believe it will taste even better with rice. Naming this blog leo tunapika wasn’t by chance. This is a daily question and on Tuesday this week it was no different. We had to attend a meeting in the evening so that meant we’d reach home a bit late. On top of that I just didn’t feel like cooking…yep!! It happens to all of us. Buying take away wasn’t an option and neither was sleeping hungry. I entered the house clueless on what to prepare (bearing in mind I wasn’t up to it). Hubby wasn’t of much help since he just said he’ll eat whatever I’ll cook O-o. 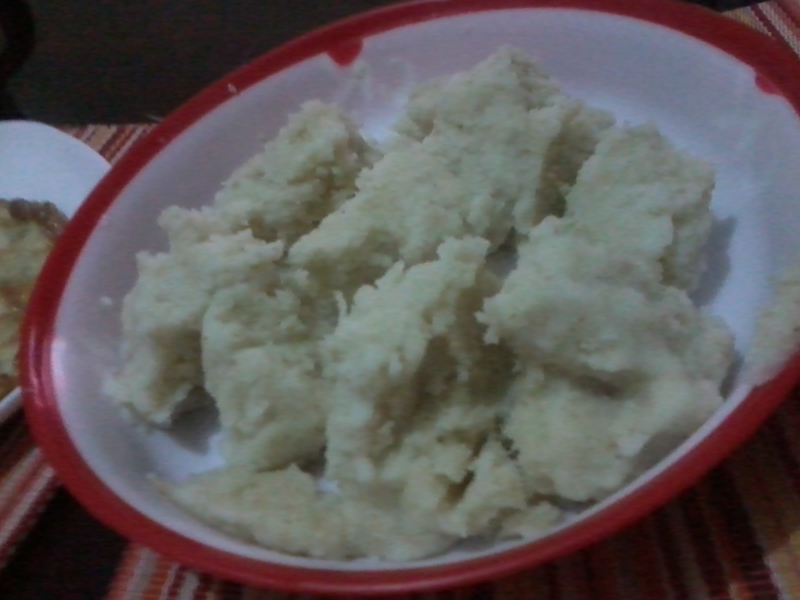 So, lemme begin by saying that there was some leftover ugali in the fridge so I sort of had something to work with. I also had an extra packet of milk. 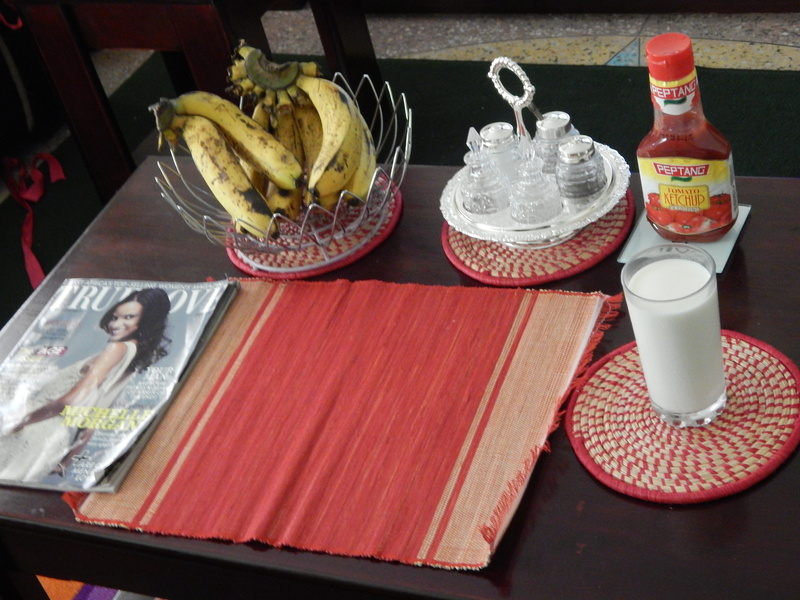 I decided to simply warm the milk and the ugali, separately of course then fry some eggs. (finally a solution). This meal took at most 10 minutes to put together. Heat some oil in the pan.Let the oil heat completely this will ensure the egg doesn’t stick to the pan, thus ease when flipping it over. In a cup with the eggs, beat in the ingredients. 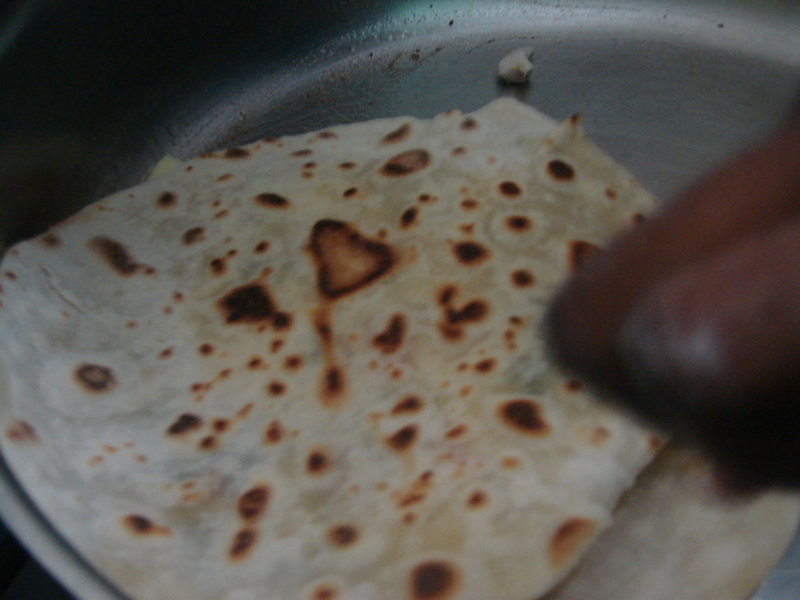 Once the bottom side is fully cooked, according your preference, we like it well done, flip it over. 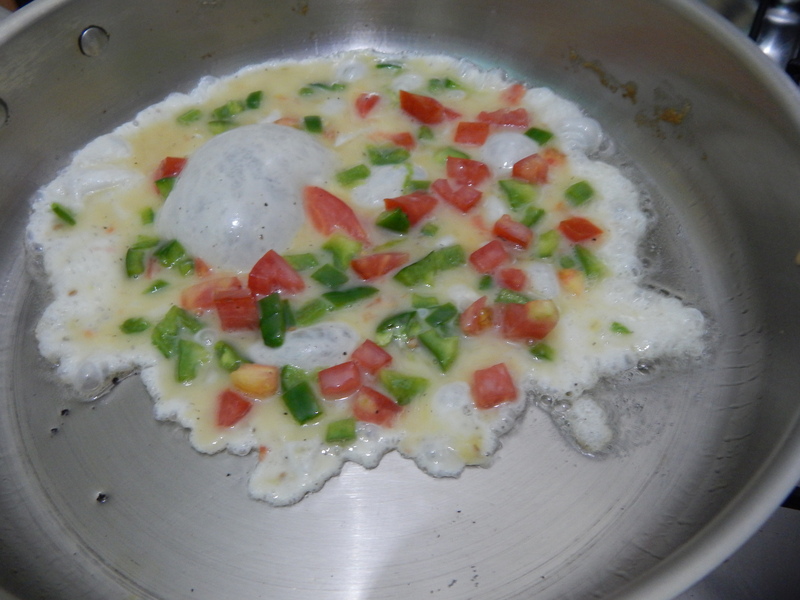 I’m excited to say I successfully flipped over an egg *yippee*. 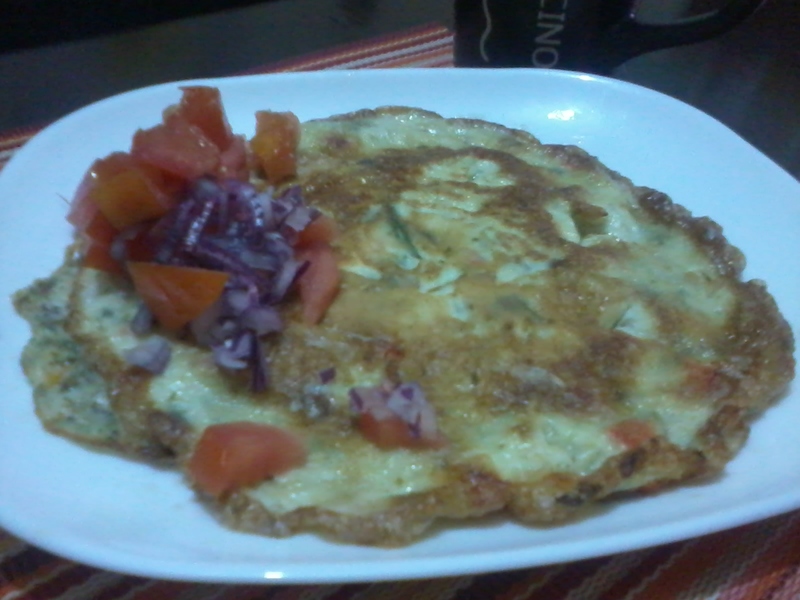 Garnish with some chopped onion and tomato. 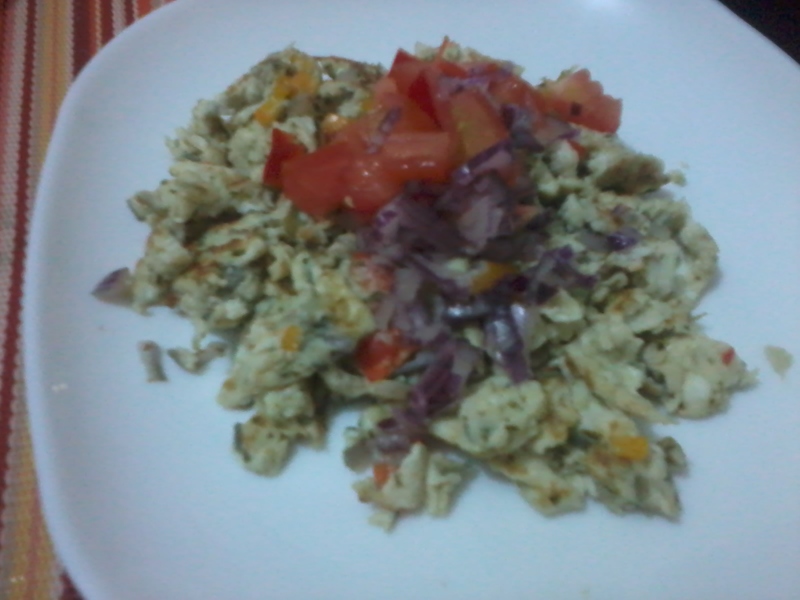 Just for fun, I scrambled my eggs. They had the same ingredients as the ones for hubby. 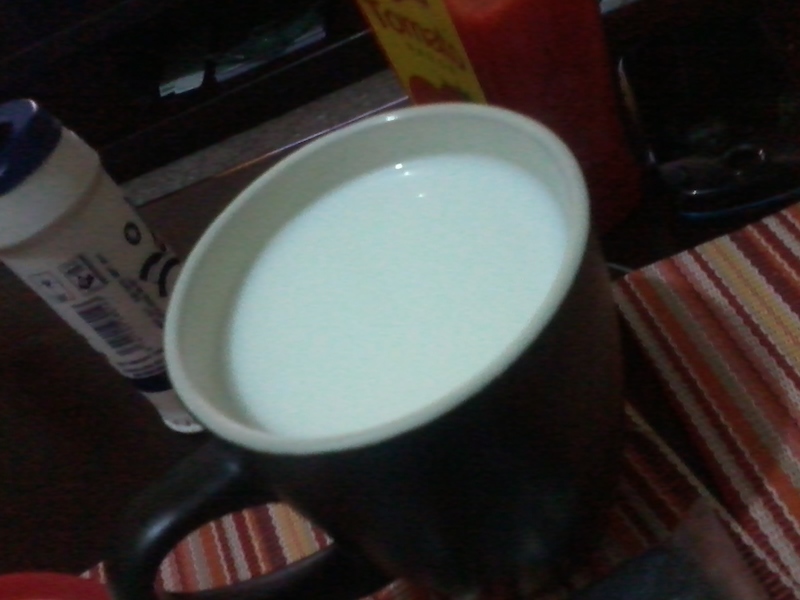 Enjoyed with a glass of warm milk. In my position what would you have cooked?